When I set out to purchase a car last year, I never knew it would be such a challenge. 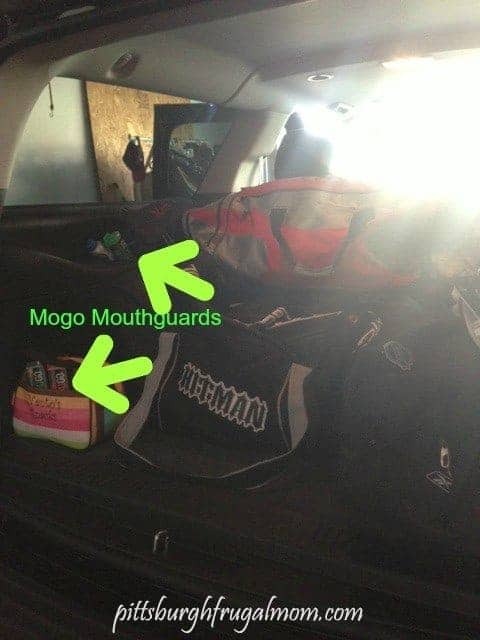 We needed space and I wanted a safe car, but what I found was a way to negotiate effectively and really get the car of my dreams so I could tote my kids off to hockey and my daughter to all of her events! The story actually has many sides to it from saving for a vehicle to how to negotiate a great price. 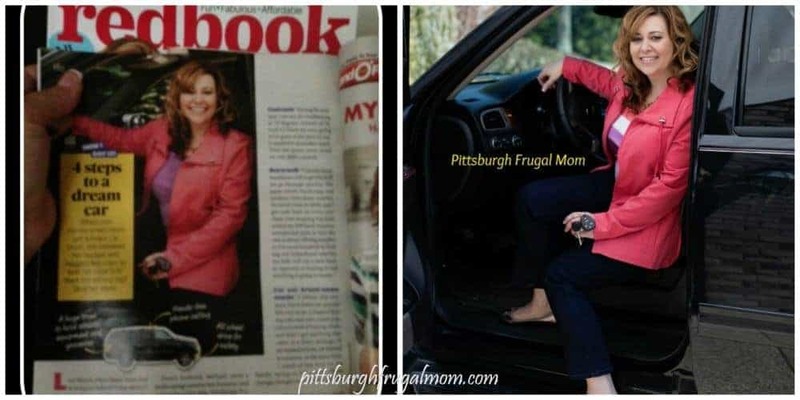 Redbook captured the savings part and I told the tale the other side of the tale on Pittsburgh Frugal Mom last summer of how to really save when dealing with dealers in a series of stories as we tried to buy a vehicle! This is how the driveway looked, waiting for our arrival, lights, Camera, Action! 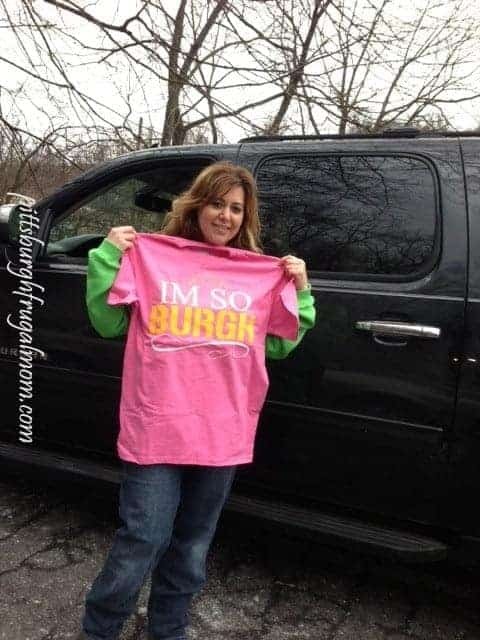 A few days before the photo shoot I met up with Mike Hitt of MCM in Pittsburgh and he provided me and my children with these great tees to wear while getting ready for our photo shoot and to just hang out in ‘burg’ style! They are fantastic shirts, cotton, with a special ‘diamond’ window embedded on each one! 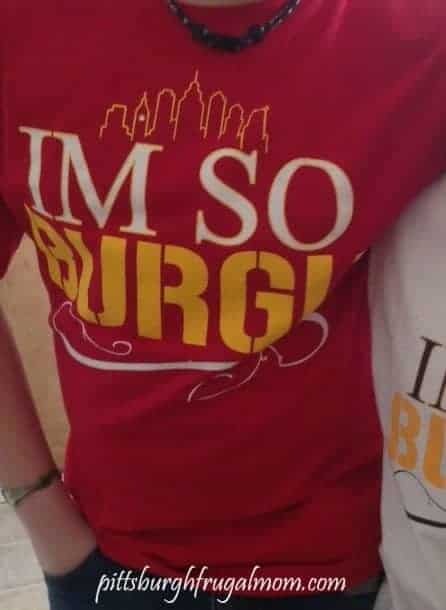 If you want to order your own, make sure to check out his great site, to get a tee and become part of the “IM SO BURGH” revolution. 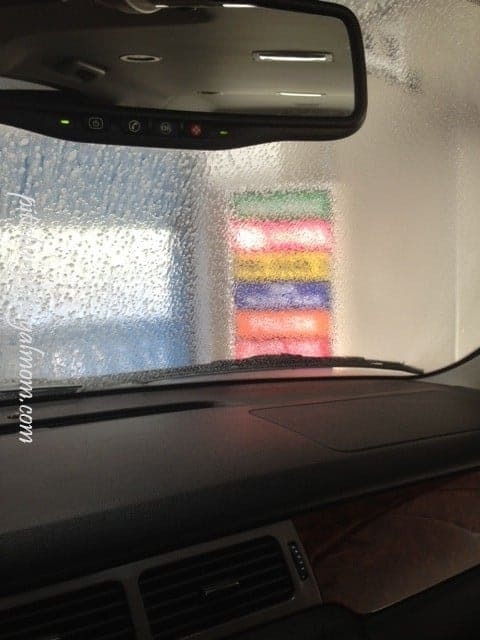 On the morning of the photo shoot, my first stop was the car wash, to make certain that the car, which was the focus of the Redbook story would be clean and shiny. 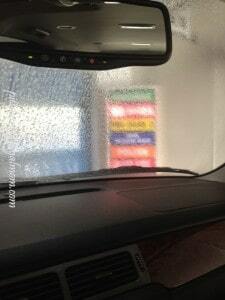 Here we are at the car wash at 6 AM in the morning. Once I got home from the car wash, the boys greeted us and then we waited for our make up artist to arrive at the house. We were getting ready to meet a brilliant person who really knows how to command face, makeup and all the extras and her name was Reema Anbari. Reema is nothing short of amazing, as is her client list and I hope to work with her again! 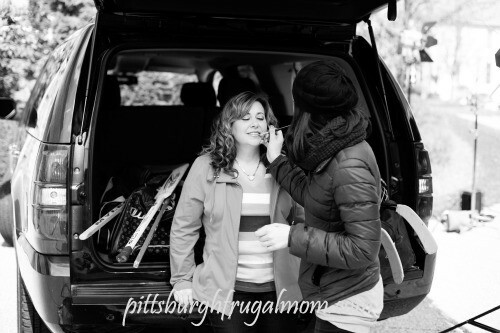 Reema did my make up and hair first, and then she prepared my daughter and sons, all the while responding to calls that were coming in from our photographer, Jorg, who was setting up camp at the photo shoot location. As you will see, Reema got my curly, unruly locks under control for the shoot! Reema packed up and so did we and we were off to on our onset destination, with hockey sticks, hockey clothing, wardrobe, mouthguards from MoGo, Shoes from LUGZ and cold air waiting to greet us. As you might remember our Spring was not so spring-like and the weather that day while sunny was about 40 degrees and I was in peep toe wedges and the kids were in shorts! 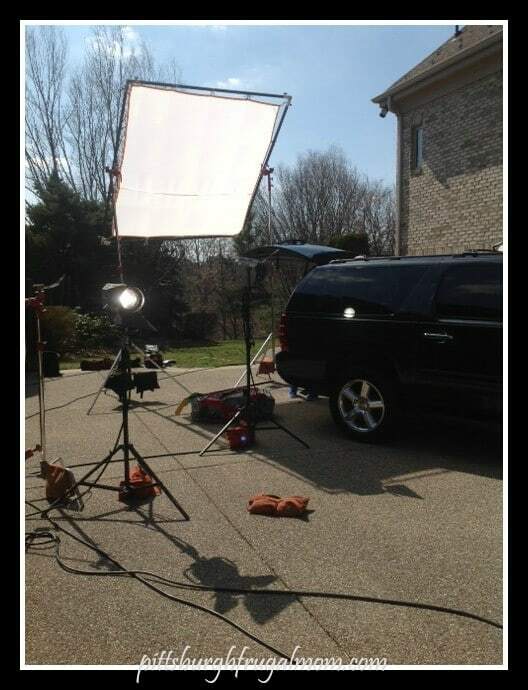 We literally had a Suburban packed wall-to-wall with stuff for the shoot. We had spoken to the editor a few times and we knew what we needed to bring. Once we arrived and got set up, Reema tended to our make up and hair to keep the wind from ruining anything that might work as an acceptable photo. 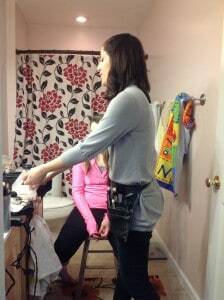 It was tireless work on her part, as she continued to pamper, primp and keep things perfect for over 3 hours! Here’s a peek at her fixing up my son, myself and everyone in between! 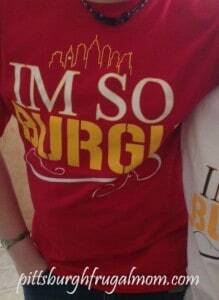 You might see the really colorful LUGZ on the boys. These were a perfect match for their hockey shirts. There were a lot of photos taken and the kids entertained themselves in between shots, playing hockey, and talking to their friends and each other! You might recognize the one photo that I have below as it is almost like the one in Redbook. How did I get these photos? 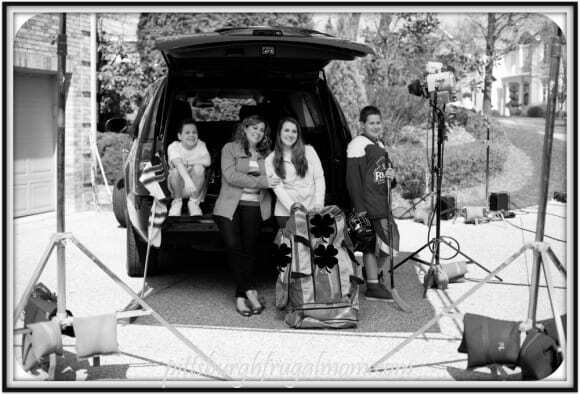 My wonderful photographer friend, Kristin Becket was on location with me and the kids and behind-the-scenes taking photos so that I might have them to share with you! Kristin is also responsible for the photos that now grace my website and my brand. While we were taking a break, Kristin and I took off to a pillar, and shot a few photos that are now my Brand! If you are looking for really professional photos and someone who can work with kids, that would be Kristin of Kristin Becket Photography. I have been working really hard on my website to bring all of you consumer news about various products and how they might apply to each of your lives and help you reduce your bottom line costs when purchasing items. I use all the strategies that I share with you daily to live my life and I have heard from so many fans via email, tweets, and comments that they are learning how to save while spending and that is my objective! As Pittsburgh Frugal MOm, I consistently repeat the mantra that you can, “‘save while you spend” and that you should, “get the most out of every thing you purchase.” I have also been known to say, and I believe that Frugal is not ‘cheap’ , rather it is knowing how to get the best brands at the cheapest prices which means spending, saving and getting quality products! Let’s face it buying some cheap product only means that you will end up buying the real thing later on down the line and spending and re-spending which is not frugal. My kids and I had a lot of fun and learned so much during that day long shoot! It was absolutely amazing and I feel blessed for all the opportunities! Thanks Redbook! What fun to see the behind the scenes!